In my previous blog, I talked about Kailash Caves in Bastar. Today, I am talking about a place called Mainpat which is known as Shimla of Chhattisgarh. It is located about 45 km. away from Ambikapur in Sarguja districtin Chhattisgarh. The present blog is a part of extract from a brochure published by Chhattisgarh Tourism Board. Location: Spread over 368 sq.km, this plateau called Manpat in Saguja district offers breathtaking views of mother nature. It is located at the height of 1099 meter from the sea level. Out of this area 226 sq. km is surrounded by dense forest. Melodiously singing streams, gracefully flowing tranquil rivers, and dense forests brimming with rich flora and fauna enchant millions of travelers. Ayurvedic herbs, rare plants and vibrant varieties of avifauna enliven the beautiful plateau. Mainpat consists of 24 villages with a total population of 25000. Mainpat is truly a hidden gem, with lots of adventure awaiting tourists in its green slopes, beautiful valleys, gently flowing brooks, unexplored waterfalls and forest. Historic Importance: After the India-China war in 1962-63, Tibetan refuges settled on the plateau and today, the Tibetan population here is approximately 1800. Very rich in their roots, Tibetans have maintained their vibrant culture and Budhist flavour. A very authentic and highly unique way of life, Buddhism offers the way to Nirvana. Based in Surguja, the people here offer a warm delight to the travelers, giving glimpse of their Buddhist culture that transcends all religions. Worth Seeing Places: Let's take a look at the worth seeing places in Maipat. Here the first comes is the Buddhist temple. Trace of Buddhism can be seen at Rajim as well in Chhattsgarh. Well, here we discuss about the features of Buddhist temple in Maipat. Buddhist Temple: The most famous Tibetan festivals are celebrated in this temple. These include: The day of Lord Buddha's first speech after enlightenment, The day lord Budha returned from heaven to meet his mother after attaining Nirvana, new year and Dalai Lama's birth day. This temple exhibit the real confluence of Buddhism and tribal culture of Surguja. Next comes Tiger Point. It is a beautiful waterfall that falls from a height of 60 m. Since this was a territory marked by Tigers, it came to be known as the Tiger Point. At this point the river is at its most beautiful best and surrounded by lots of medicinal herbs. The Government has constructed railings so that travelers can enjoy breathtaking views from here. Machali Point is other attraction envelopedin the dep mountain ranges. Full of little fishes, this river falls deeper, creating a spectacular waterfall. This point is caled he Machali Point and the height of the waterfall is 48 meter. Through the droplets and fog of the faling water, the hills look even more meserizing. Here, you can also see an 80 meter waterfall. Tourist can enjoy various water sports. Parpatiya is another attraction covered with heart-strring surroundngs Many awe-inspiring points can be seen from Parpatiya, Mainly -Bandarkot Mountains,Raksamada CAves, Dulha-Dulhan mountains, Banraj DAm, Shyam Ghnghutta Dams and Ramgarh Mountains. CG Tourism Board has created here a spot for adventure sports. Meha Point is just 8 km away from Maipat which is embraced by tall mountain ranges. 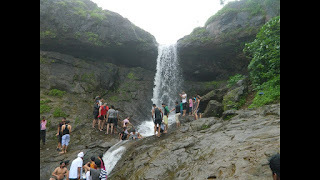 Dev Pravah (Jaljali) is beautiful stream located in Kamleshwar, flows incessantl, later falling into an 80m waterfall. This waterfal is calld the Dev Pravah and is extremely famous for rich herbs and medicinal plants that grow around it. Mainpat is full of caves too. The main caves here are-Bandarkot, Raksamada Bhalumada and Paiga Khoh. With that I conclude. You can click HERE for other destination which fascinate me. Thank you sir. Please keep giving me your feedback. Veri nice information about Ninpat. Thank you sir/madam! keep reading my other blogs as well to get acquainted with actions.